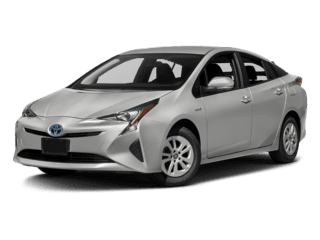 The Toyota Prius model line offers features and specs that will meet the needs of many different drivers in North Hollywood and Los Feliz. Find out which one is your ideal hybrid. The four top Prius options — the Toyota Prius, Toyota Prius c, Toyota Prius v, and Toyota Prius Prime — are all popular choices. See how they compare in key areas below. A hallmark of the hybrid class is strong fuel economy. No matter which Prius model you choose, you’ll save money at the gas pump in Hollywood. The Prius lineup features 4-cylinder engines combined with hybrid electric motors. See how they compare in horsepower, torque, and available all-electric modes. Safety is critical for drivers navigating the often rough roads of West Hollywood. Thankfully, all Toyota Prius models offer active safety features in the Toyota Safety Sense suite. Test drive a new Prius model in person, or browse our used Toyota hybrid selection, to determine which Toyota Prius you should buy. We’re also happy to go over any service-related questions you have, including info about the 30,000 mile service appointment. *Manufacturer’s Suggested Retail Price, excludes the Delivery, Processing and Handling Fee of $835 for Cars, $900 for Small/Light Trucks (Sienna, RAV4, Highlander Gas, Highlander HV, 4Runner, Tacoma and Venza), $1195 for Large Trucks (Tundra), and $995 for Large SUVs (Sequoia and Land Cruiser). (Historically, vehicle manufacturers and distributors have charged a separate fee for processing, handling and delivering vehicles to dealerships. Toyota’s charge for these services is called the “Delivery, Processing and Handling Fee” and is based on the value of the processing, handling and delivery services Toyota provides as well as Toyota’s overall pricing structure. Toyota may make a profit on the Delivery, Processing and Handling Fee.) Excludes taxes, license, title and available or regionally required equipment. Actual dealer price will vary. Tax, Title, Tags, and $80 Dealer Documentation fee not included in vehicle prices shown and must be paid by the purchase.